NetBeans is one of the most popular Integrated Development Environment ( IDE , which provides a set of tools and features to speed up the development process, so helpful in boosting productivity of programmers). Netbeans is a free and open source Application, available for all common platforms – Linux Distors like Ubuntu 11.04 (Natty Narwhal), Fedora, Linux Mint; Windows and Mac OS X. Netbeans 7.0 (Latest Stable Version) released a week ago. Netbeans is very popular among Java EE developers, because of its features and simplicity. This post will explain how to install netbeans on a freshly installed ubuntu 11.04, from USC (Ubuntu Software Center) or shell, you can also use Synaptic Package Manager. You can also Try Eclipse IDE on Ubuntu 11.04, if you want, as Eclipse is another very popular open source IDE, but Netbeans is recommended, for beginner programmers because it’s very simple, lightweight and easy to start. A lot of free plugins are available to extend the features (support for Ruby and Rails, C/C++, PHP etc) of Netbeans IDE. I , personally don’t recommend IDE to beginner programmers, because of the fact that – ‘IDE will hide a lot of things, by creating a layer of abstraction, that we should now’; when you are experienced enough to understand the underlying details, then go for an IDE like NetBeans or Eclipse. Nebeans got 4.5 out of 5.0 in software center rating. 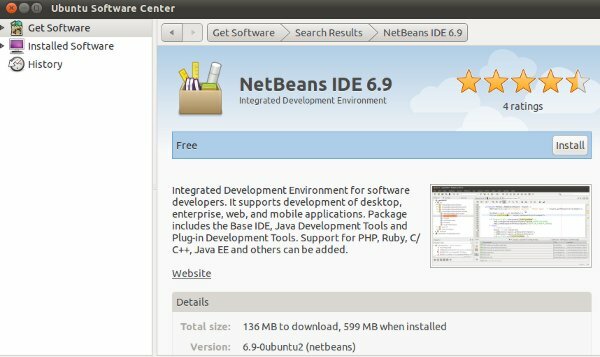 #1 : Open Ubuntu Software Center and search for ‘netbeans’. #2 : Click on install button to start the installation procedure and wait for the installation to complete. #3 : That’s all..Enjoy coding with Netbeans. 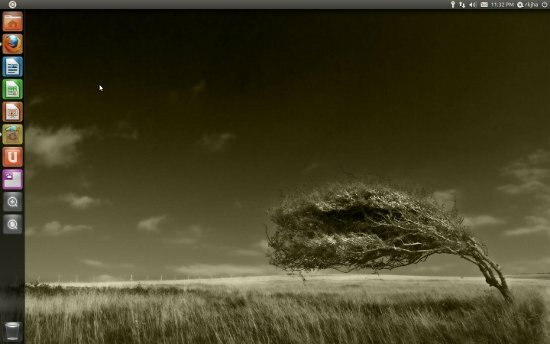 Ubuntu 11.04 – stable version has finally Released! Download now! Ubuntu 11.04 – code named as Natty Narwhal, stable version has released today (few hours ago). Ubuntu 11.04 has arrived with a lot of surprises and features, the biggest one is that – The Default desktop is Natty not Gnome 3.0 (The Next Generation Desktop, If you want to try Gnome, then go here – install gnome 3 desktop on Ubuntu 11.04 ), although you can select Gnome classic version from the login menu, if you want. Ubuntu’s release cycle is very clear – Two major versions in a year x.04 and x.10 (probably, where x = ‘The last two digit of year’). Final version has released after some Alpha versions, followed by two beta version, eliminating the RC (Release Candidate) version, this time. 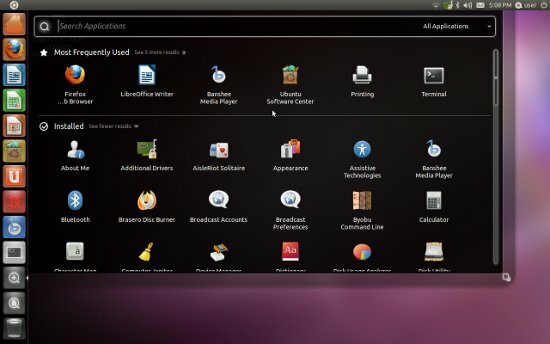 How to Get Ubuntu 11.04 ? It is free and open source, download it and install on your computer, using USB or CD. If you want more help then follow this link – step by step guide for installing ubuntu 11.04 from USB or CD drive . Google Chrome 11 – Stable Version is finally Out! : Download Now! Today, Google Chrome Team has declared the next stable release of the browser – Google Chrome. Google Chrome is one of the most popular web browser of this planet. it has released it’s next stable version 11 with a lot of improvements and features. 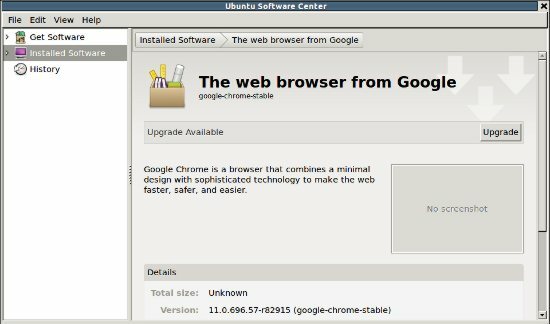 Google chrome 11.0.696.57 is available for Windows ,Mac and Linux based OS like Ubuntu, Linux Mint etc. One of the great improvement is that – You can provide speech input through HTML.. This feature is really very good for web developers, so that the visitors can read the content of a page just in single click. The voice to text feature with speech recognition is some thing we always wanted, let’s enjoy (Assuming that Artificial Intelligence level is acceptable) this feature with Google Chrome. Some GPU related 3D effects has been added, it means better Gaming in browser, with more fun and reality.